Such a beautiful walk again today. 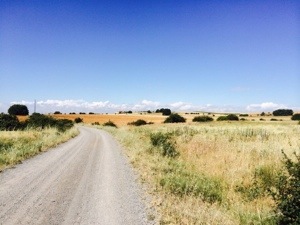 Firstly the trail led through the city of Leon to the industrial outskirts. Not so beautiful, but was good to see areas off the tourist route. It was then into the countryside and the walking just got better and better. 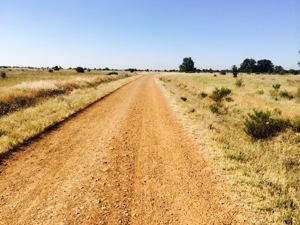 Much of the walking was on gravel, and very little of the stony, rocky Roman roads that we’ve been traipsing over for the past 20 days. 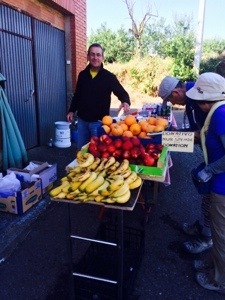 At about the halfway point, in a tiny, tiny village, there was a lovely man with the most beautiful, happy, smile with fresh fruit including bananas, freshly squeezed orange juice, chocolates, muesli bars, dried fruits, nuts and much much more. And all for just a donation. The generosity of villagers towards pilgrims really causes me to feel very humble. I just hope they realise how much they are a appreciated.